The people of the Quebec province love their beer, and the abundance of microbreweries attests to that fact. Although most bars serve a variety of locally brewed beers, you'll have the best experience if you head straight to breweries that serve their products right where they were brewed. This allows Canadian beer aficionados to enjoy the freshest creations and taste exclusive blends because some beers are crafted in such small quantities that they are never bottled and distributed. Here are eight great places to drink locally brewed beer in and around Quebec City. La Korrigane, which made its debut in 2010, is a craft brewery where beers are produced in small quantities and served only in its pub. The owners are involved in local food associations and help promote Quebec City’s producers by serving light meals and snacks made from locally grown and produced ingredients. One of its most famous beers is the Emily Carter blueberry beer (fruity, not sweet), but other notable blends include the Mary Morgan, a light, refreshing white beer, or the Croquemitaine, which has subtle maple undertones. The atmosphere is warm, welcoming, and informal. There’s a small patio, always packed and lively with beer lovers wanting to drink in every last bit of Quebec City’s short summer. Brasserie INOX Brewery is one of the city’s oldest microbreweries and is located in the Old Port. A few years ago, Inox created a stir when its owners announced they were moving to the Grande Allee, the most touristic of all Quebec City streets. Longtime fans feared the place would lose its rebellious ways, but since the clientele moved along with the beer, INOX Grande Allee has become the best place to have an informal drink uptown. The pub looks like a cool industrial loft, and the patio is the perfect place to people watch, especially when the Grande Allee becomes pedestrian during summer festivals. Locals order beer by the pitcher to wash down pub snacks such as nachos and European-style hot dogs. L'Archibald microbrewery has five locations: The first one is located in Lac-Beauport, which is a mountainous suburb of Quebec City where the decor feels like a welcoming lodge where you stop for a well-deserved bite and drink after a day skiing. Others include one that's a five-minute drive from the Montreal airport, in Sainte-Foy, in Blainville, and in Trois-Rivières. As for the beer, it’s reliably good and brewed at many locations. The food served ventures outside the usual pub fare, with steaks and fish dishes, as well as pizza and pasta. A short and beautiful ferryboat ride away from the Old Port, Le Corsaire Microbrasserie makes nine different beers, from a light white beer flavored with ginger and citrus fruits (the Tanaka) to a black stout beer infused with roasted oats (the Davy Jones). The pub is also known for its wide selection of single malt whiskeys and excellent coffee beans, which are roasted on the premises. Food is served for lunch and dinner and includes sandwiches, salads, pizza, and snacks. A few steps away from the collegiate institution Cégep Limoilou, La Souche welcomes a younger crowd that loves to hang out in its rustic interior. Cozy couches, tables made out of thick trunk slices, and odd chairs create a relaxed setting, perfect to sample the pub’s regularly changing selection of beers on tap brewed by different Quebec microbreweries. It also offers a wide selection of bottled beers, as well as an inventive pub menu featuring re-imagined classics made with local ingredients. This charming pub is located on L'Île-d'Orléans, which is a rural island on the Saint Lawrence River and 30 minutes from downtown Quebec City. Pub Le Mitan is the serving outpost of Microbrasserie de l'Île d'Orléans, a microbrewery that distributes its beers all over the province. Eleven beers are brewed during the year, and the seasonal varieties are especially exciting, such as winter’s Jean Dit Laforge (a strong beer with malt, chocolate, and vanilla flavors) and spring’s Suzanne Marceau (an amber beer infused with the island’s maple syrup). The microbrewery’s restaurant is open for the summer and early fall season when customers can enjoy the pub’s relaxing patio and unfussy bistro cuisine. 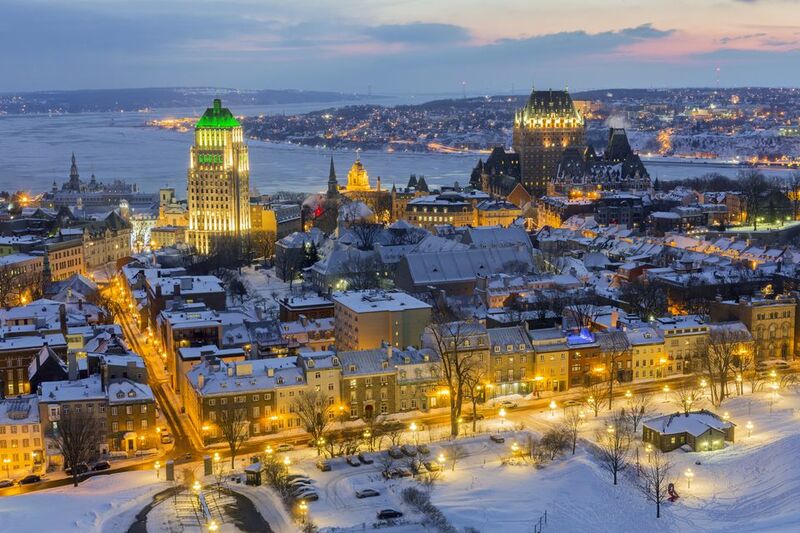 Are you heading to visit the Basilica of Sainte-Anne-de-Beaupré, Mont Saint-Anne, or Charlevoix? Stop for a refreshing beer at Microbrasserie des Beaux Prés. With a strategic location, a patio right on the Saint Lawrence River, and a relaxed atmosphere in an area otherwise populated by fast-food joints, Microbrasserie des Beaux Prés makes an ideal rest stop on Route de la Nouvelle-France. Explore the brewery’s beer menu by opting for the small tasting format or choose a pint of your favorite among the more than 15 varieties and enjoy it with lunch or dinner. The brewery is open late every night, which is a rare thing in the area.